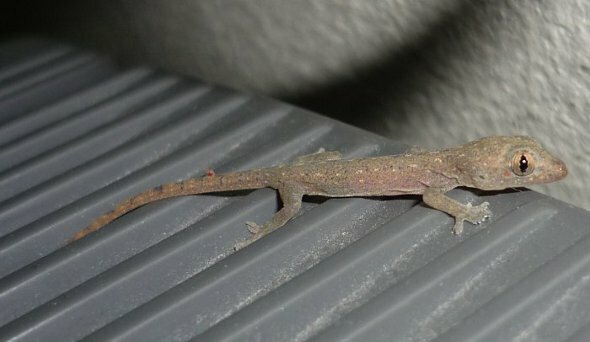 The little chingchok lizards can be seen everywhere in Thailand, often high up clinging to walls or ceilings and are often referred to as the house lizard. These natives of south-east Asia are harmless and are a common sight in homes, hotels and guest-houses where they should be welcomed because they like to eat mosquitoes. Part of the gecko family, the chingchok varies in size but tend to grow to a maximum of 15cm. They also vary in colour ranging from shades of white to dull brown. They are fascinating little creatures to observe as they usually position themselves near a bright light and wait for their prey to come to them. If you are sitting at any outdoor restaurant in Thailand, just look towards the nearest source of light to see the chingchoks and geckos waiting patiently on walls for their next insect meal. Microscopic hairs on the chingchok’s feet give it the ability to climb and hang on to almost any surface. And if that wasn’t impressive enough, the chingchok can lick its own eyeballs. For a creature with no eyelids, this comes in handy to keep the eyes clean. This diminutive lizard also has another trick up its sleeve, or more accurately, its tail. If a predator catches the chingchok by the tail, it has the ability to shed the tail and escape. The tail will always grow back.